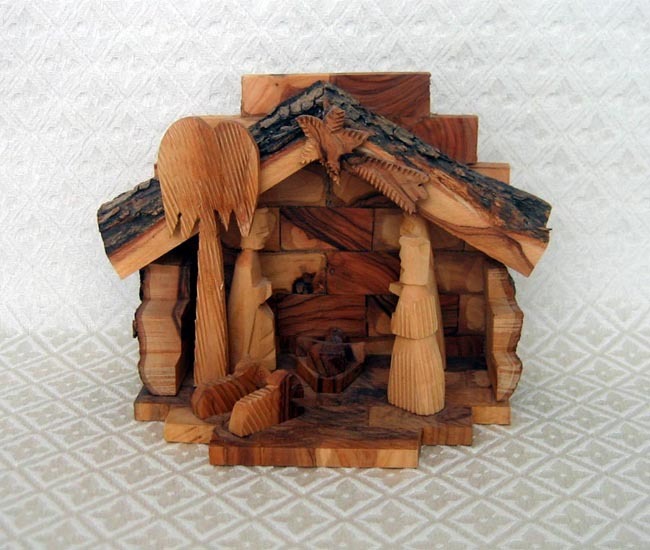 This Nativity set was hand-carved in Bethlehem from olive wood. The scene shows one shepherd with the Holy Family. This item measures 5.5 inches tall by 7.5 inches wide. The handcrafts trade has evolved as a cultural tradition of the Palestinian people over many centuries. This indigenous art form has since become an industry of great importance to the local people of the Holy Land who rely on it for a livelihood, and to Christian pilgrims from all around the world whose holy pilgrimage can be memorialized for a lifetime in cherished olive wood or mother-of-pearl souvenir. Olive-wood art can be traced back from the 16th and 17th centuries. Historical documents provided by the Christian pilgrims of that time show the beauty of the olive wood rosaries and crucifixes and their popularity among pilgrims.